Chemical defenses, repellents, and attractants are important shapers of species interactions. 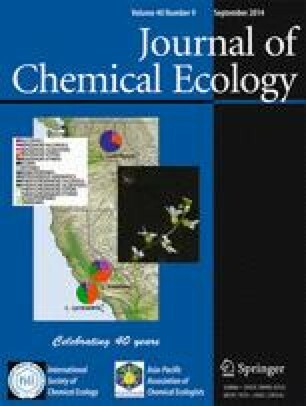 Chemical attractants could contribute to the divergence of coevolving plant-insect interactions, if pollinators are especially responsive to signals from the local plant species. We experimentally investigated patterns of daily floral scent production in three Lithophragma species (Saxifragaceae) that are geographically isolated and tested how scent divergence affects attraction of their major pollinator—the floral parasitic moth Greya politella (Prodoxidae). These moths oviposit through the corolla while simultaneously pollinating the flower with pollen adhering to the abdomen. The complex and species-specific floral scent profiles were emitted in higher amounts during the day, when these day-flying moths are active. There was minimal divergence found in petal color, which is another potential floral attractant. Female moths responded most strongly to scent from their local host species in olfactometer bioassays, and were more likely to oviposit in, and thereby pollinate, their local host species in no-choice trials. The results suggest that floral scent is an important attractant in this interaction. Local specialization in the pollinator response to a highly specific plant chemistry, thus, has the potential to contribute importantly to patterns of interaction specificity among coevolving plants and highly specialized pollinators. The online version of this article (doi: 10.1007/s10886-014-0497-y) contains supplementary material, which is available to authorized users. We are grateful to Kate McCurdy (Sedgwick UC Reserve), Michael Rule (Turnbull National Wildlife Refuge), Sylvia Haultain and Eric Frenzel (Sequoia National Park) for their hospitality and assistance, to Jim Velzy (UCSC Greenhouse), Galen Pelzmann, Aliya Ingersoll, and Jill Piorkowski for help in the laboratory, Rob Franks at the Marine Analytical Lab, UCSC for invaluable assistance with the GC/MS equipment, Glenn Svensson for help with olfactometer design, and Bruce Lyon and Bob Montgomerie for facilitating the spectral analysis. We also thank Mark A. McPeek, Benjamin Ridenhour and two anonymous reviewers for useful comments on an earlier version of the manuscript. This work was supported by the Swedish Research Council, the Fulbright Commission, The Royal Swedish Academy of Sciences, and the Crafoord Foundation to M.F., and by the National Science Foundation to J.N.T. (NSF-grant DEB-0839853) and R.A.R. (NSF-grants DEB-0746106 and IOS-0923765).